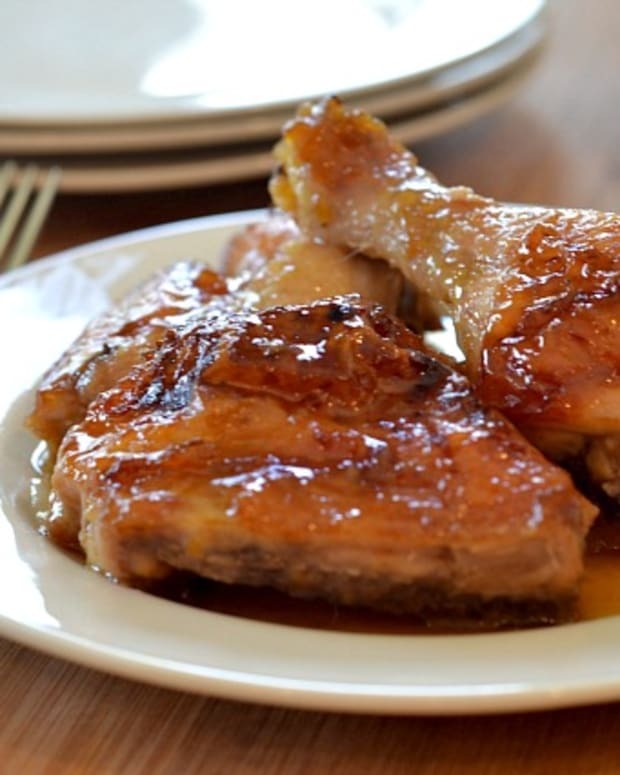 Great tasting, fast and easy chicken recipe. Favorite go-to shabbos dinner when I&apos;m in a rush. It&apos;s also great because the potatoes cooked with the chicken can serve as a delicious side dish. I tend to not use measurements when I cook, but I will try to approximate. 1. Cut onion into rings and lay the rings over the bottom of a pan so that the pan is mostly covered. 2. Skin chicken bottoms and rub salt, pepper, and paprika over the surface of each piece of chicken. 3. Place the chicken bottoms on top of the onion rings in the pan. 4. Slice sweet potato and regular potato and surround the chicken with the slices. 5. Bake at 350 for one hour, uncovered. 6. Remove from oven and add Gold's Duck Sauce to the pan, making sure every piece of chicken gets covered. 7. Bake uncovered for another half hour or until chicken is desired texture.